The Luckenbach School and Community Center, located at 3566 Luckenbach Rd., will be the site of 2010’s first Country Schools Open House on Saturday, January 2 from 11:00 a.m. – 4:00 p.m.
Back when the school was in use, there was an old-fashioned school bell that rang for the children to attend classes, six days a week. Today the site is used for precinct voting, and is where the Luckenbach Community Club meets for its monthly meetings. Pick up your map to the school at our Visitor Information Center at 302 E. Austin St. Or, for more information, visit www.historicschools.org . Luckenbach Texas— RR 1376 off Hwy 290, Luckenbach; reserved seats $35/single or $50/couple and general admission $30/single or $40/couple; 9:00 p.m.; concert, dance, champagne toast and balloon drop; music by Mike Blakely y Los Whiskey Traders. 830-997-3224 / www.luckenbachtexas.com . Two Volkssport Walks to be held on Thursday and Friday. A Memorial Volkssport Walk will be held on Thursday, December 31 noon until 2:00 p.m. departing from the St. Joseph’s Halle at 212 W. San Antonio St. in Fredericksburg noon until 2:00 p.m.
Later that night, walkers will meet at 11:00 p.m. at the Halle for the Midnight Volkssport Walk that begins at midnight. For information, call 830-992-2053. December 28, 2009 Posted by c21sunset | Uncategorized	| Comments Off on Two Volkssport Walks to be held on Thursday and Friday. 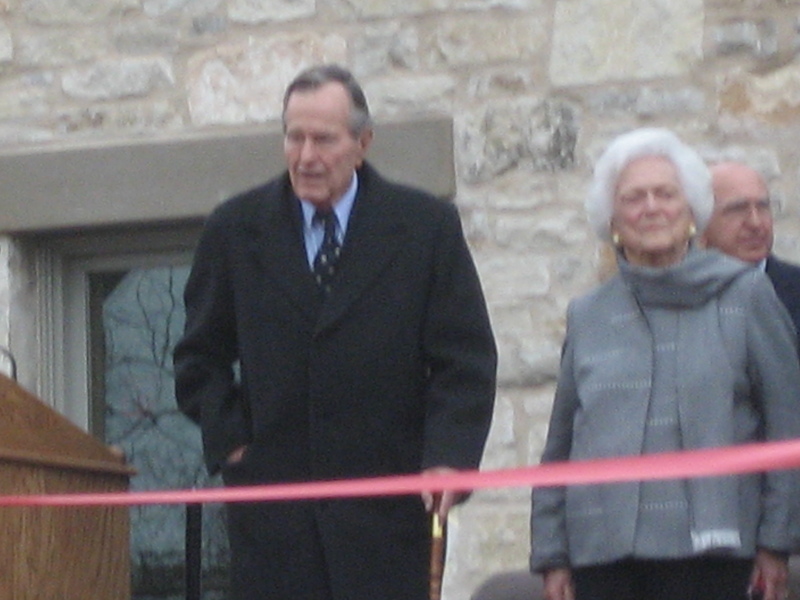 Last Monday in cold weather conditions over 5000 visitors came to see President George and Barbara Bush officially open the remodeled and expanded National Museum of the Pacific War in Fredericksburg, Texas. Many veterans of WWII were among the visitors. The George H.w. Bush gallery is 33,000 square feet of exhibit space, blending interactive technology with artifacts and archived media from World War II. and current president and CEO of the Foundation served as Master of Ceremonies. John Kerr, chairman of the foundation’s board, Governor Rick Perry, U.S. Congressman Michael Conaway were on the dias. General James T. Conway, 34th commandant of the United States Marine Corps was the keynote speaker. Performing at Monday’s grand opening was the U.s. Marine Drum and Bugle Corps as well as the cast of Fredericksburg’s Rockbox Theater. Also during the weekend there was a dedication ceremony honoring U.S. Submarine Services in World War II and a Pearl Harbor Survivors memorial. This Saturday and Sunday Fredericksburg will be the site for the upcoming Silver Spur Gun and Blade Show to be held at the Gillespie County Fairgrounds on Hwy 16 S. on Saturday, December 19 from 9:00 a.m. – 5:00 p.m. and Sunday, December 20 from 10:00 a.m. until 4:00 p.m. Admission is $5 for adults and free for children under age 12, with military and NRA discounts available with proper identification. For information, call 806-253-1322 or visit http://www.silverspurgunshows.com .